Honolulu is both the capital and largest city of Hawaii, famed for Waikiki beach, gorgeous scenery and world-class attractions such as Pearl Harbour. Beyond the modern comforts of Honolulu, the island of Oahu is quiet and strikingly beautiful. There are 23 national parks to explore and countless beaches to laze on. Cruise passengers arrive at Oahu Dock, part of the Honolulu Cruise Terminal. The terminal complex is centred round Aloha Tower allowing passengers to step right into the heart of the city. Taxis await passengers outside piers 8 and 9 near Aloha Tower Marketplace. Alternatively TheBus, Oahu's reliable mass public transport system will get you around the island in comfort. The Waikiki Trolley has 4 lines to/from major island attractions. Car rental and bicycle hire round out your other plausible transport options. Honolulu's most popular attractions are magnificent Waikiki beach, and Pearl Harbour, site of the Japanese attack in 1941. The USS Bowfin Submarine Museum and USS Arizona memorial are not to be missed. Visit the former royal residence Iolani Palace for a taste of Hawaiian culture and the history of the islands, and see Foster Garden for 14 acres of indigenous floral splendour. 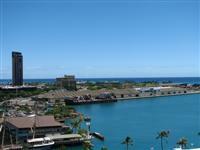 Two attractions close to the terminal are Chinatown and Aloha Tower complex. Aloha Tower is both a key landmark and top shopping centre for visitors. Other options include Ward Warehouse and the Ala Moana mega-mall containing a huge range of international shops. Waikiki's International Market Place is great for souvenirs with over a 100 unique shops. The Farmer's Market on Saturday's is great for delicious local produce.